Chardonnay by Cape Barren of Adelaide Hills. . The generously proportioned, big boned, leesy French oak genre, Dijon Bernard Clones 76 and 95, harvested off fully mature vines, thirty years of age at Charleston in the Adelaide Hills. Vibrant, fresh hues. Treated to lees stirring and partial malolactic for textural opulence and palate richness, its creamy grapefruit nougat palate will appeal to enthusiasts of the medium to full bodied white meat styles of Chardonnay. Located in the renowned McLaren Vale region of South Australia, the Cape Barren vineyards benefit from the unique maritime climate of long warm summers cooled by afternoon ocean breezes, ideal conditions for grapes destined for full-bodied red wines. 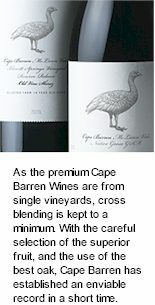 Starting from humble beginnings with the first vintage in 1999, Cape Barren Wines is the result of a 35 year friendship between Peter Matthews, who has 30 years experience in executive Sales and General Management, and Brian Ledgard, a third generation grape grower, and their lifelong interest in vineyards and wine. Their ambition was and is, to produce full bodied wine of uncompromised quality and excellence. Cape Barren Wines are made from fruit parcels carefully selected from premium estate vineyards throughout the McLaren Vale. Cape Barren first produced the Old Vine Shiraz, and as the name suggests, the fruit was selected from the 70 year old vines at Blewitt Springs. This wine quickly gained a reputation and was followed by the introduction of the Native Goose Grenache Shiraz Mourvédre and the Native Goose Shiraz. Most recently was the addition of Silly Goose, a blend of Adelaide Hills Sauvignon Blanc and McLaren Vale Semillon and Viognier. Cape Barren is comprised of over 150 acres of quality vineyards across the McLaren Vale region of South Australia, including Willunga and the premium Blewitt Springs area. Slightly elevated, the Blewitt Springs sub-region is bordered by the Adelaide foothills. At around 150m above sea level the higher altitude promotes slower ripening, allowing the fruit to mature over a longer time frame, promoting superior flavour development. The Blewitt Springs vineyard is gently undulating with a unique soil structure of very deep sand over ironstone. The precious vines at Blewitt Springs are protected on all sides from strong winds by native forest and mature tree windbreaks. These 25 acres of vines were planted some 70 years ago, the old vines produce a low yield of approximately two tonne per acre. Only select parcels of fruit from this vineyard make it into the Reserve Release Old Vine Shiraz. The unique terroir of this vineyard allows the crafting of an elegant Shiraz that possesses a profound depth of flavour. McLaren Vale is only 37km from the heart of Adelaide CBD and situated on the beautiful and geographically diverse Fleurieu Peninsula. Known for its mild climate McLaren Vale is home to some of the best wine grapes in the country. The Willunga sub-region of McLaren Vale is located on the coastal plain, near the southern ocean providing a strong maritime influence. The fertile soils are red brown alluvial loams, sandy and darker soils with a climate typically of cool wet winters and warm dry summers. In recent years Australian and International wine critics have sung the praises of McLaren Vale Shiraz, earmarking McLaren Vale as one of the best Shiraz producing regions in the world. The estate's winemaking team crafts abundantly flavoured wines which are supported by a structure and backbone that will deliver improvement with a decade in the cellar. The reds are matured in French oak hogsheads and American oak barriques for many months, with a policy of minimal handling. Cape Barren Old Vine Shiraz is a wine of uncompromising quality and rare excellence. The warm summers at the Blewitt Springs vineyard are often accompanied by the arrival of magnificent Cape Barren Geese. These rare and striking birds, once feared near extinction, are welcome visitors to the vineyard, and Cape Barren have named their immensely successful flagship wine after them. Cape Barren Old Vine Shiraz is being recognised as a benchmark McLaren red. This generously flavoured wine shows the plum, black fruit and spice flavours of Shiraz combined with an earthy complexity faithful to its McLaren Vale origins.